The wall was an easy 5 minute walk from the hotel. I'm back in Moscow. Didn't post from Kirov because the internet was way too slow. I didn't climb nearly as well as I would have liked to but it was still lots of fun. The format of the comp was different. Instead of one route for qualifiers there were two routes. The time allowed was supposed to be 5 minutes which is down from the usual 6, but it was changed to 4 minutes just before the men were supposed to start climbing. Starting out on the first route. Getting near my high point on route one. 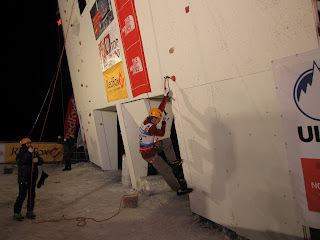 The first route was going well until I made a big mistake and left my tool hanging from the ice bollard while clipping. Normally I put it in my mouth to hold it but the holes in the ice were deep and it seemed secure. While clipping I bumped the tool and it fell out, ending my attempt. 2nd route near my high point. The second route I was going pretty well, but when the wall got steep my energy ran out and my hand slipped off the tool. 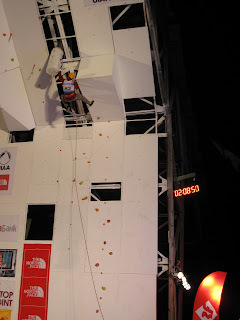 I don't know if I was climbing to fast or if it was the cold/flu I have been trying fighting off that drained my energy. 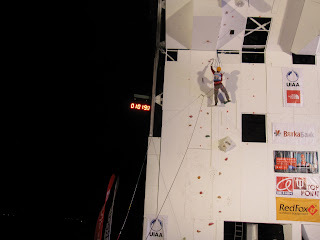 This competition was the first one that I participated in the speed climbing event. I came in 36th out of 49. The top 24 were all Russian. 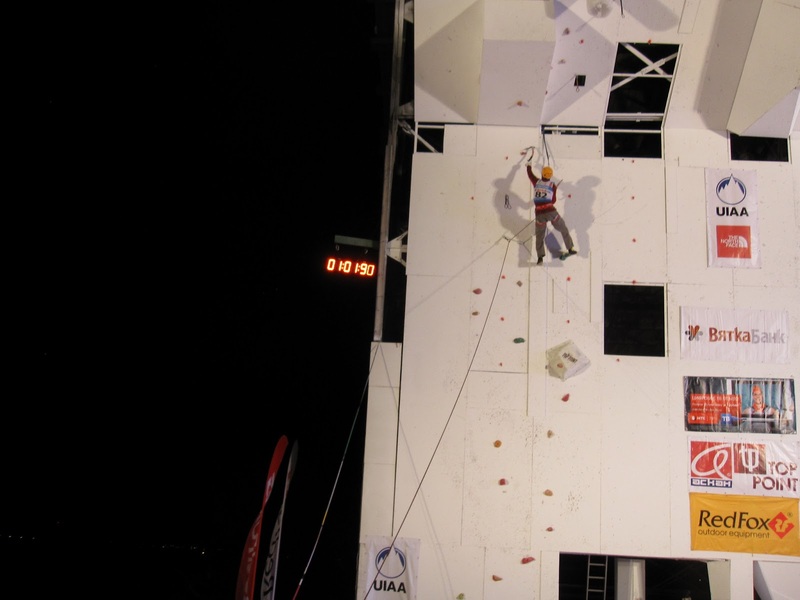 It was also the speed climbing championship so each country got a team ranking. They take the top 2 men's and 2 women's scores and add them together. 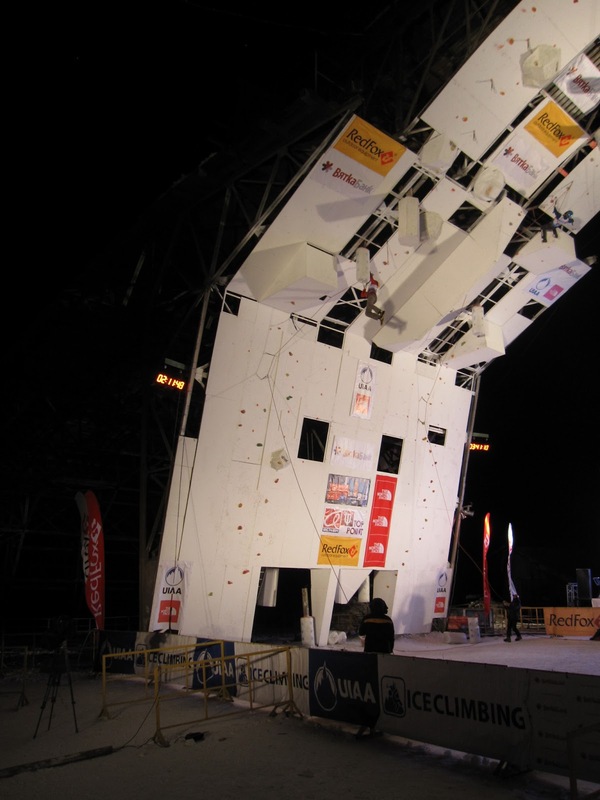 Gord and I both climbed but there were no Canadian women who wanted to come to Russia to participate. Overall Canada came in 7th. Lowering off after climbing the 1st speed route. I was expecting Russia to be kinda bad but it was definitely one of the best and most fun for the actual competition.